This is a limited reissue of Miwa’s second solo album! This reissue includes a new version of the CD booklet and a DVD of the b&h2 concert tour. Many from the original beauty and harmony all star band return and bring a number of their talented friends with them. 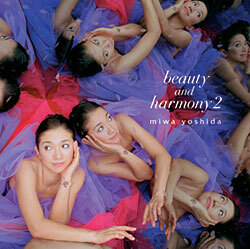 The concert DVD features performances from the beauty & harmony 2 tour which supported the original CD release. Miwa also released a single called Namida no Mangekyo in conjunction with the original release of the album.